Ivan Image Converter is a batch conversion image processing software to convert multiple graphics file formats easily. Using this utility you can perform editing operation on your image and then convert to any image format. It supports a very wide range of image formats. Publisher claims that it supports over 170 file types. Image Converter also supports Command Line interface, to convert images without the use of the GUI. Features: This application allows you to edit your favorite picture as per your requirement. It is a feature rich application support editing of your image with many more options. You can perform resize, rotate, flip, mirror, crop, filters, watermarks, morphing effects, color enhancements etc. using this tool. You can set various effect for your image such as color, filters, morphing, distort and each one of them have many more option to create a best quality of image. In batch conversion mode you can add files to the list for conversion and set advance options for all images. Application allows you various options such as set resize by specifying height, width, set interpolation filter type from the available drop down list, set preserve aspect ration etc. Application also has feature to watermark your image, you can add watermark text and watermark image to your image file. You can set color effects, set filter/distort/morphing options by selecting appropriate filter, distort effects, wave and morphing effects. With other option you can set output file name. Overall: It is an excellent utility to edit and convert images to any format of your wish. Ivan Image Converter is the most comprehensive program of its kind on the market today, and can open images in virtually any format: it currently supports over 170 file types. The user has a choice of 44 different types to which they can convert the source images. The conversion process itself is incredibly fast, the whole process being completed in the blink of an eye. The user interface in Ivan Image Converter could not simpler, using icons for as many tasks as possible to reduce the need to endlessly navigate menus. Full properties, including file size, image size, image name, etc. can be viewed for each image within the program. The program can also print images directly. 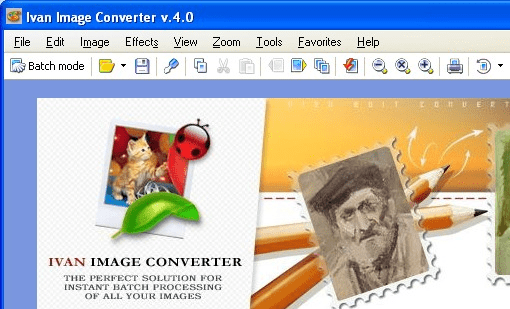 Ivan Image Converter also includes full support to carry out conversions through Command Line input, allowing you to convert images without the use of the GUI, and to execute conversions from within other programs.